Clean and wash the greens. Wash the dal, drain and keep aside. Chop the onions and tomatoes roughly. Slit the green chilli. In a pressure pan combine greens, yellow moong dal, onions, green chilli, tomatoes, garlic pods, tamarind, turmeric powder and salt. Add 1 cup water and pressure cook for 2 whistles. Cool and transfer the contents to the clay pot. In a kadai heat the oil. Add cumin seeds, whole red chillies, coriander seeds and asafetida and transfer them to the cooked greens. Mash well with a pappu guthi or a masher till it resembles a pulp. Check salt and transfer them to a serving dish. 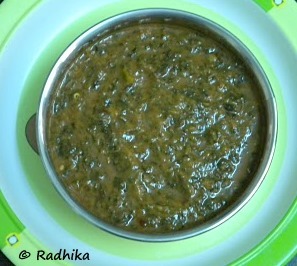 Serve along with hot rice with ghee. 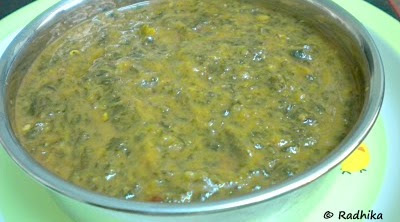 This Masiyal is off to Divya Vikram who is hosting Healing foods : Spinach event. Nice combination for a healthy curry. Luv the click. First time on your space..liked all the recipes. I can’t wait to try some of your recipes! I’ve started a little blog to gather flags. Help me out and send a flag my way! How does this dish taste? very nice blog………..plz visit my blog if time permits……..
plz can u say where red amaranthus is available…………. I believe it is seasonal and is available in the greens section of any vegetable or fruit market in my place. It depends on where you live.